In Sewing > Show & Tell. 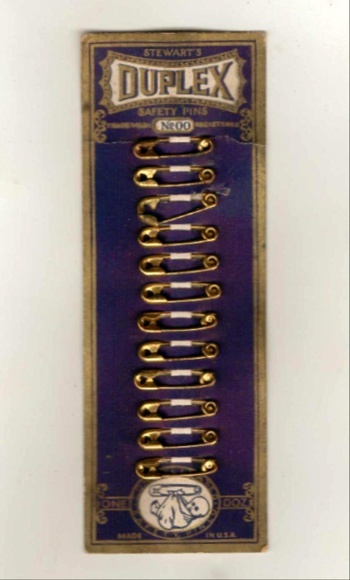 This is a vintage (circa 1900's-1920's) Stewart's Duplex brand Safety Pins card which held one dozen number 00 size safety pins (all remain but one, 3rd from the top, has 'sprung' out of it's head) - They are made of brass. ** Tracing research I have found they were made by the Consolidated Safety Pin Company of Bloomfield, New Jersey (est'd 1861) which was founded by I.W. Stewart. - The "Duplex" name was trademarked in the 1898-1900 time period ("Duplex" safety pin patents were also issued in 1906), and I have seen the baby logo (at the bottom of the card) first used around 1909 in advertisements. I could locate no history or references of the company past 1921.